The godzilla movies we know and love got their start thousands of miles away. In 1954 a piece of movie history was born as Gojira and released in Japan. The plot of the horror film concerned a giant monster created by American nuclear weapons tests. The monster goes on the first of what will become multiple rampages through the streets of Tokyo, destroying everything in its path. We, of course, know Gojira as Godzilla, and there have been a string of the movies made because Japanese audiences went wild for the film. It was deemed an instant classic in the tradition of King Kong by Japanese critics. It didn't take long for a wily American producer named Joseph E. Levine to buy the rights to the movie, remove any trace of political content remotely critical of the US, and insert a deadpan Raymond Burr as Steve Martin. Gojira became Godzilla and a movie franchise was thrust upon an unsuspecting world. Godzilla is, without a doubt, a terrible movie. It spawned a string of terrible sequels, horrendous knock-offs, and even inane modernizations. Yet, people love Godzilla movies in America, Japan, and all over the world. The giant fire breathing monster became a Japanese pop-culture icon, and the movies made in Japan were dubbed into English and brought stateside almost as soon as they were released. The children of the baby boomer generation grew up with Saturday morning creature features that would invariably include at least one Godzilla movie each month. Some local television stations would even host a sort of Godzilla theater - running Godzilla movies every week. Part of the fun of Godzilla films is the incredibly bad special effects, even by 1950's & 1960's standards. As Godzilla rips through Tokyo the vehicles he overturns and tanks that fire upon him can easily be identified as toys. The monster himself is obviously just a Japanese actor in a rubber suit. Several scenes in the original film feature airplanes attacking Godzilla (ala King Kong) and even the smallest kids in the theater can spot the wires on which the models are suspended. Star Wars these movies are not. Over the course of the series of Godzilla we watched a transformation in the giant reptile. He went from being a nigh unstoppable villain to a folk hero of sorts. In each successive movie after a while a new monster would rear its ugly head and wind up in a fight to the death with Godzilla. Godzilla fights Rodan, Mechagodzilla, and even King Kong in the movie Godzilla vs. King Kong or King Kong vs. Godzilla - the title and the winner depended upon which continent you saw the movie on. All of the additional monster creations are another part of the fun of the movies. Other classic Japanese monsters launched from Godzilla movies include the benevolent Gamara (a giant, flying turtle) and the somewhat disturbing Mothra (as one would expect, a giant moth). The Godzilla craze started dying out in Japan during the late 1960's and 1974 saw the last Godzilla film made... for a while anyway. 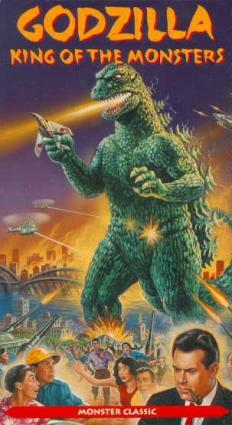 Godzilla nostalgia continued and the monster was reborn in Godzilla 1985. Audiences were duped into seeing the movie in hopes that modern cinema technology would have resulted in a better film. It wasn't. The 1985 Godzilla was just as cheesy and laughable as all who had come before. The franchise was reborn, however, and several more films followed. The most famous modern version, however, is the American made Godzilla which starred Matthew Broderick (Ferris Bueller's Day Off, Inspector Gadget) and was released in 1998. The special effects were undeniably better, but the movie was just as bad as any Godzilla that had preceded it. Some things, it seems, are just meant to be bad. When it comes to Godzilla, that is a part of the attraction.